Through compelling reminiscences of his grandfather's life in America and Japan, Allen Say delivers a poignant account of his family's unique crosscultural experience. He warmly conveys his won love for his two countries and describes the strong and constant desire to be in both places at ones: When in one country, he invariably misses the other. His grandfather, he tells us, would understand. 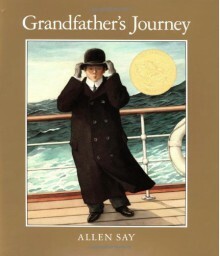 Illustrated with exquisite paintings, intimate and memorable, Grandfather's Journey is Allen Say's most personal and remarkable picture yet of the bridging of two cultures. I really really enjoyed this book. Short sentences and great story telling that all children will enjoy. I loved this book. The illustrations were evocative and sensitively done, and the text was deceptively simple. One for the permanent collection.